Welcome to the first installment of Prize Peek Posts, where we give you a preview of some of the awesome loot we’re going to be giving away at this year’s Scarefest! 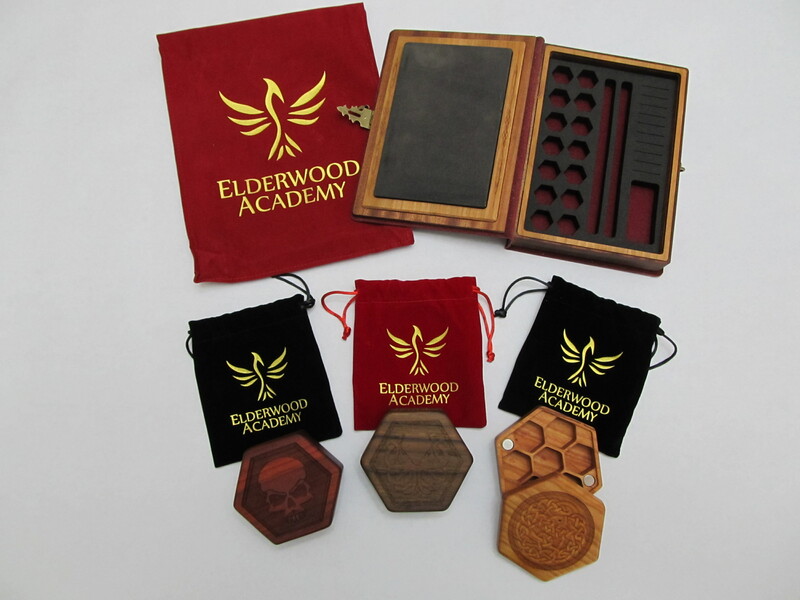 First up we have some absolutely beautiful dice boxes from Elderwood Academy. We have three Hex Chests, made from redheart, walnut, and cherry woods, with carved lids and beehive-style storage for seven of your very favourite dice. We also will be giving away one mind-blowingly cool Spellbook Game Box, which holds not only your dice, but also pencils, minis, and other useful gaming tools. Next, Skullsplitter has donated more dice than you have ever imagined in your wildest dreams, including one astounding Demi-God Bundle. What’s a Demi-God Bundle, you ask? Imagine jumping into a ball pit. Now imagine that the ball pit is full of dice. It’s kind of like that, but with less bruises. 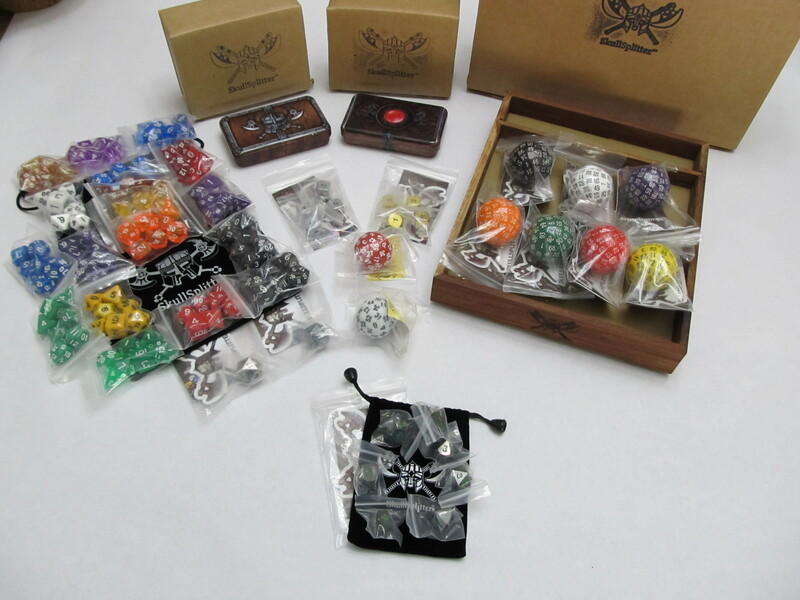 This bountiful bevy consists of 150 dice plus two cases. 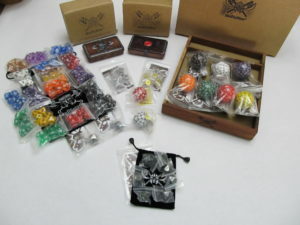 You get five different kinds of metal dice. You get great big dice. You get 60-sided dice. It’s honestly pretty overwhelming, but in a good way, like winning the dice lottery. Skullsplitter has also donated seven d100s, a Rosewood dice tray, and a set of Black Dragon dice, because apparently they are possessed of demi-god-like generosity. So what are you going to do with all those dice? You’re going to roll them, of course. But how do you want to roll? Not on some lame table top where they’re going to go skittering off the edge. No, you need a proper tray. And thanks to Darksilver Forge, you will have a chance to win one. They have donated two rather stunning Cthulhu’s Lair Dice Trays. At eleven and a half inches across, and lined with velvet embossed with an image of our dark overlord (no, not our Overlord, but you know, an overlord), this tray exemplifies everything good about being a gamer geek. 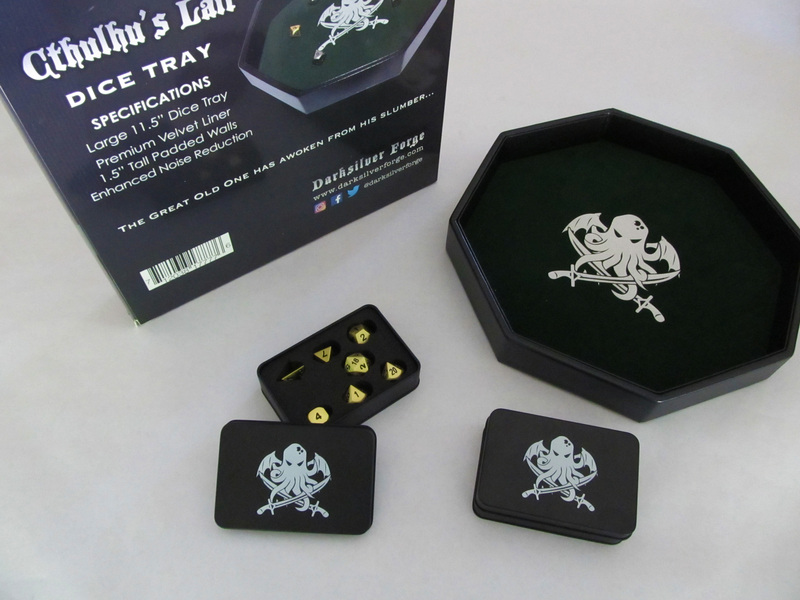 And as if that weren’t enough, we will also be giving out two sets of Cthulhu’s Gold solid metal dice sets! 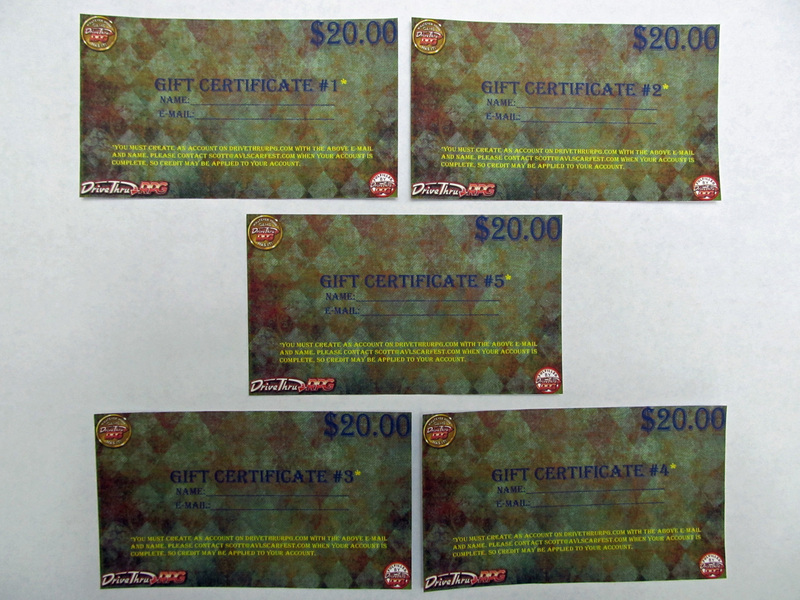 And last but not least, we will also be giving away five $20 gift certificates from DrivethruRPG. DrivethruRPG is the largest online retailer of downloadable RPG content, with products ranging from Chaosium to Monty Cook to Wizards of the Coast, so you have zillions of different gaming materials conveniently appear instantly on your computer or mobile device! 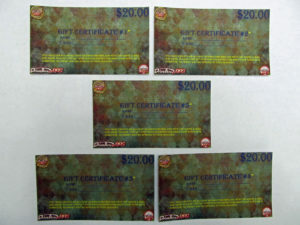 That’s it for today, but stay tuned for future Prize Peeks!